This morning, two racist signs were found outside of a University of Michigan sophomore dorm. 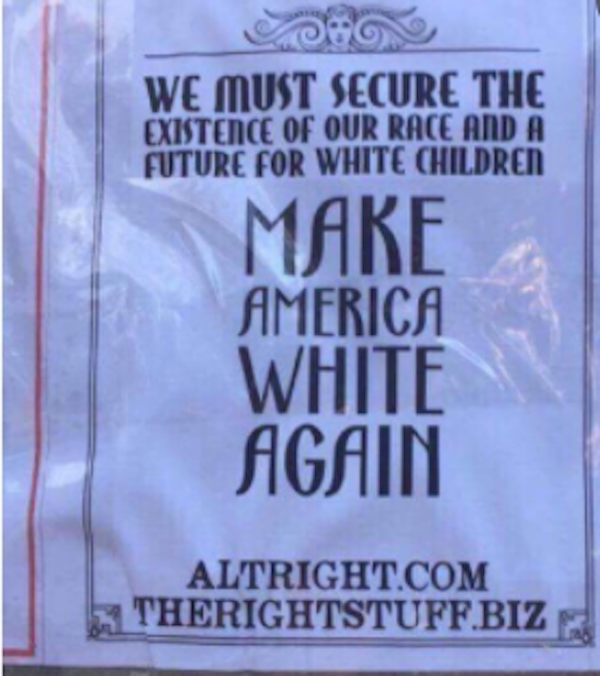 The "Make America White Again" posters were hanging on a cement cylinder near Stockwell Hall usually used for students to promote campus clubs and activities. Both posters targeted American minorities, but one was specifically directed towards African Americans. The second sign seemed to be inspired by President Trump’s slogan, "Make America Great Again." “We Must Secure The Existence Of Our Race And A Future For White Children,” the sign read, followed by "Make America White Again." By the time DPS arrived at the scene, the posters were already removed. 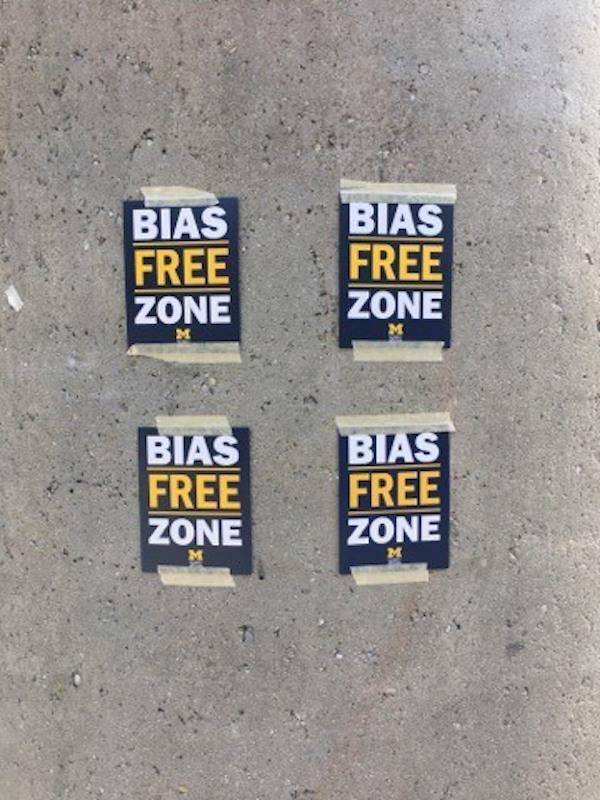 Shortly after, they were replaced with four smaller "BIAS FREE ZONE" signs. 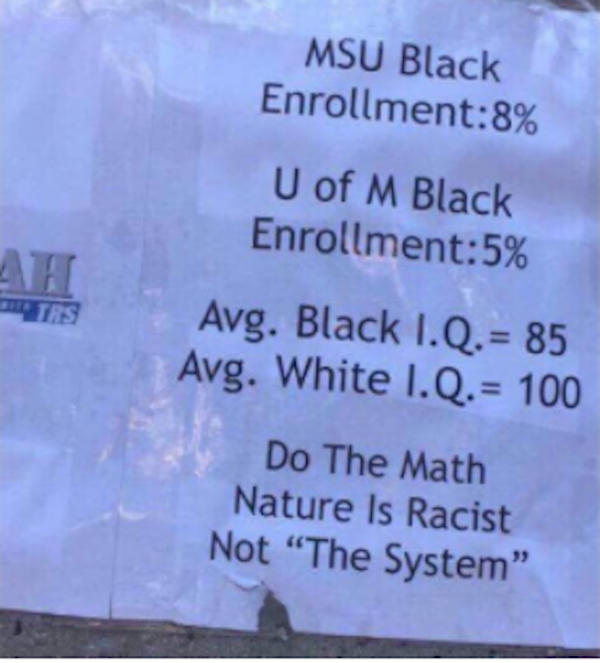 This isn't nearly the first time UMich has seen racism on campus. Last week, a graduate student kneeled on The Diag for 21 hours to protest national and campus racism, only for the 'M' to be peed on a day later by a white male. Earlier in the semester, hate speech was found scrawled on two black students' dorm name tags, and anti-Latinx graffiti was found on The Rock. "One of the best things about this school is the diversity of all the people in it," Roslyn Vern, a UMich engineering student told The Tab. "Someone who is directly attacking that diversity…that's just so wrong and it shouldn’t be allowed here." When the racist flyers on campus were discovered, President Schlissel was giving a speech at the annual President's Leadership Breakfast. While he addressed the incidences that occurred earlier in the semester, he did not discuss the latest flyers.